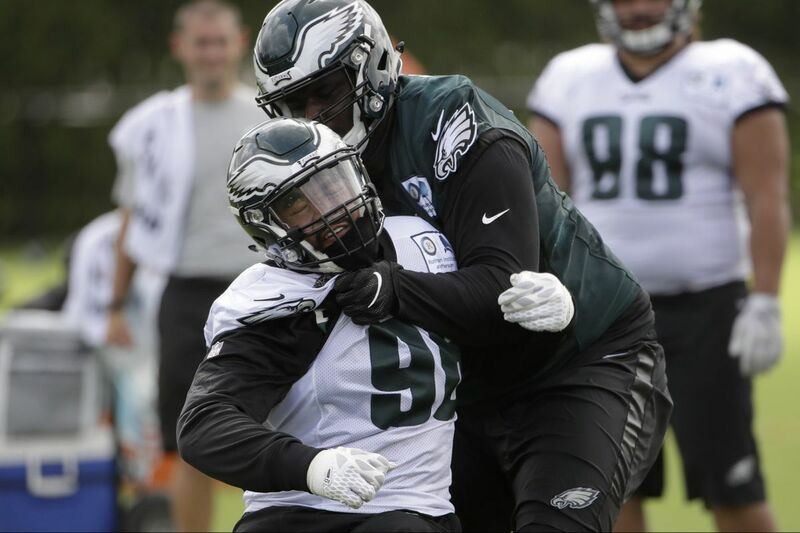 Philadelphia Eagles defensive end Derek Barnett (left) and offensive guard Dillon Gordon during training camp Monday. Derek Barnett flashed at times during the spring, but it would be foolhardy to put much stock in "non-contact" practices. The rookie defensive end showed he can turn the corner without having to be very physical. But the greatest test for Barnett will be going against left tackles who are as quick off the snap and big enough to stifle speed on the outside. He needs to get stronger, improve his technique to use leverage to his advantage, and do both to develop a repertoire of moves that will make him a dangerous rusher. Tuesday's one-on-one line drills were a weaker version of what we'll see once the pads are out, but they showed how Barnett still has a way to go. And that's what training camp is about. "You're too wide," defensive line coach Chris Wilson yelled after a Barnett rush against undrafted rookie tackle Victor Salako. Barnett rushed off the edge from a four-point stance and faked an outside move before using his left arm to swim inside. Salako blocked him to the ground. "You're afraid of confrontation," Wilson continued. On his next rush, Barnett went right at the 6-foot-6, 335-pound tackle with a bull rush. He pushed Salako back, but only so far. "That's better," Wilson said. Barnett will have the luxury of time. With Vinny Curry and Brandon Graham slotted ahead of the defensive end, and with the addition of veteran Chris Long, the Eagles won't have to rely on Barnett to step in right away and have an impact. In most cases, rookies – even ones drafted in the first round – have a difficult time getting to the quarterback consistently. But Barnett will play and the Eagles will likely need some sort of contribution this season. With only two running backs in the early portion of camp, Donnel Pumphrey has been a busy bee. But it's not just the lack of numbers that have made the rookie one of the quarterbacks' favorite targets. He is quick and has beaten a handful of linebackers out of the backfield. Yes, 7-on-7 drills will often benefit the offense. And, yes, I want to see Pumphrey in pads before I start coming close to any conclusions. But he has been sharp. He has yet to drop a pass and is almost always turning upfield – or already vertical – before a defender gets his hands on him. The other running back in camp, undrafted rookie Corey Clement, looks slimmer than he did in the spring. Running backs coach Duce Staley said in June that he wanted the tailback to get down to around 215 pounds. The highlight of the day for Clement came when Nick Foles hit the rookie on a slant for a touchdown. Tight end Billy Brown did a nice job of rubbing cornerback Mitchell White out of the play. Carson Wentz has been the first up during all drills, naturally, but his backups have gotten as many repetitions if not more during 7-on-7s. Foles had some nice tosses during Tuesday's session. He connected with receiver Greg Ward for about a 30-yard gain when he floated a fade before the arriving safety. Foles had another touchdown pass when he scrambled and found an improvising Ward just at the goal line. Ward plucked the ball out of the air and made sure he got over the plane. The undrafted rookie continues to impress. Matt McGloin was intercepted by linebacker Don Cherry when he threw wide of receiver Mack Hollins. But the quarterback rebounded and had several strong throws, including a touchdown toss in which receiver David Watford outmuscled safety Tre Sullivan for the ball in the back of the end zone. Sullivan had a pick earlier when he undercut Dane Evans' deep toss to Hollins. Joe Walker is almost a year beyond when he tore his anterior cruciate ligament. The second-year linebacker has been full-go the last two days, but it should take some time before he feels completely like himself. He got beaten by Brown on an intermediate fade, but displayed an impressive vertical when he outjumped several players for a tipped pass. Walker is still penciled in as the backup middle linebacker, behind Jordan Hicks. Jim Schwartz is constantly in his ear. "Why are you trying to confuse everybody?" the defensive coordinator asked Walker after one call. I asked Schwartz to single out a few of the young cornerbacks who have stood out since the spring, but he predictably avoided naming names. "All those guys have had ups and downs," Schwartz said. The position is obviously very much up for grabs in terms of the starters and those who will claim roster spots. "We're going to have keep an open mind," Schwartz said. That's why under-the-radar, returning corners such as C.J. Smith or Aaron Grymes or undrafted rookies such as Jomal Wiltz, Randall Goforth and White can't be counted out. White has competed since the spring. He broke up a pass to a slanting Hollins that drew this response from defensive backs coach Cory Undlin: "He's got hands like a snake." And Wiltz did a nice job of switching off and breaking up a pass. But Ron Brooks, the only veteran corner here for the first three days, is still clearly ahead of the others. He's still not 100 percent, but when inserted, he has consistently made plays on the ball as he did when he broke up a McGloin corner fade to receiver Marcus Johnson. Wentz spoke with reporters for the first time this camp, and there is a noticeable difference in his demeanor. It's to be expected, but he's much more relaxed than he was a year ago. He hasn't downplayed the significance of having a year under his belt. The intensity will increase in two days, but he's been having fun. He has consistently been the first quarterback to hustle from one drill to the other, sometimes sprinting at full speed. Offensive coordinator Frank Reich or quarterbacks coach John DeFilippo will sometimes race Wentz and the other quarterbacks. It lightens the day, but it also keeps the players competitive. You can't underestimate the competitiveness of Wentz and the quarterbacks. They're almost always testing each other. And some leftovers: Hollins practiced long-snapping for a period. He did well. He could be an option if Jon Dorenbos were to get hurt during a game. We saw last season how important that job can be when Brent Celek was pressed into duty and struggled. … Defensive tackle Beau Allen (pectoral tendon) continued to work out on a separate field with the Eagles training staff. … Receiver Shelton Gibson had his daily drop when he couldn't pull in a low, but catchable, pass from McGloin.